I Keep trying to convince my wife that Allah and God are two distinctly different entities. As a Christian having grown up in an Arab country it is understandable why she has adopted the ‘Allah’ name as a name for God or Jesus. 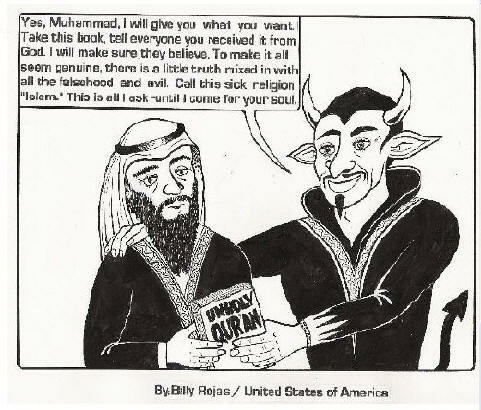 It is just ‘assumed’ by Arabic Christians that they are one in the same because of their language and upbringing in a Muslim world where all their Muslim friends and neighbors refer to God as ‘Allah.’ Also as stated in the video below, bibles in the Arabic language use ‘Allah’ as a reference to ‘God.’ This is and always has been a very erroneous mistake that Arabic bibles would be wise to correct. But the historical and pronounced reality is that not only are they not one in the same deity, they are in fact polar opposites. Yes God is God and Allah is the opposite of Him; the devil or the anti-Christ. To prove the point all when has to do is simply read the Headlines everyday. They are headlines that are distinctly opposite of the philosophy of the Christian God but are directly attributable to directives clearly stated in the Koran: the book of Allah. Here’s Walid Shoebat giving an in depth historical account of the origins of Allah and how and why it has no relationship with the God of the civilized world.